Regardless of the season, there is almost always that one player that everybody asks about on social media and during radio interviews. The one guy who we get inundated with questions about, either regarding why he’s playing so poorly or why he’s not being properly recognized across the league for his outstanding contributions on the ice. Occasionally, the questions are about a trade. This year, the badge of honor belongs to Gabe Vilardi, and the 19-year-old forward hasn’t even played a single NHL game, ever – which is exactly what is creating all the stir. Drafted 11th overall in 2017, he is among the handful of elite prospects in the Kings organization. Although he was limited to just 32 regular season games with the Kingston Frontenacs last season, he certainly made the most of it. Vilardi put up 58 points in that stretch, including 22 goals. He followed that up with 22 points (11 goals, 11 assists) in 16 playoff games. Overall, in 143 regular season OHL games, Vilardi posted 157 points (68G, 89A), along with a plus-27 rating. Last January, Windsor had traded him to Kingston, as the worst kept secret in junior hockey was that Vilardi had been ticketed to turn pro in June and would be playing with the Kings in 2018-19. Throughout the summer, we had him pegged to play RW3 in Los Angeles. 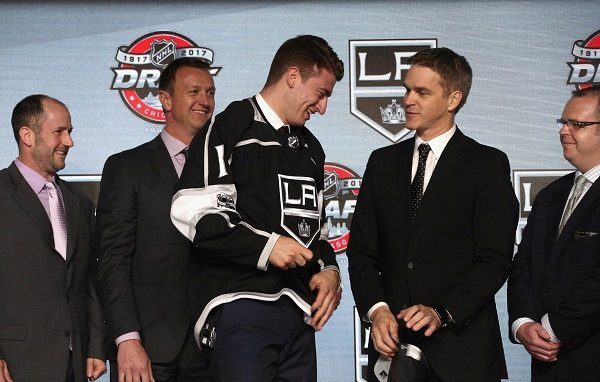 And even as late as mid-August, literally within minutes of us taping Kings of the Roundtable, our sources inside the Kings front office were telling us despite some late summer setbacks, Vilardi should be good-to-go for training camp. One of the most common words we’ve heard when asking about Vilardi’s status over the past few months has been, ‘frustrating’ – as in, it’s a very frustrating situation. His ailing back wasn’t something that required surgery. As we understood it, while there was discomfort, etc., it was the type of thing that other players had played through in previous generations. There were good days and bad days, yet the string of optimism would usually be shut down right as he was about to clear a major milestone. The starts and stops have been quite the roller-coaster and everybody involved has had their patience tested, including Vilardi. His recent return to the ice, where he began skating with the Kings in practice, while wearing a red no-contact jersey, was seen as a key benchmark; eventually designed to getting him into an actual NHL game. Naturally, another setback occurred. This time it was a hip flexor, something that was thought to be temporary. Indeed it was, and he’s already returned to skating with the team in recent days. What’s next? That’s the question being asked regarding Vilardi? There are essentially two different types of conditioning assignments the Kings can use with Vilardi. One is a Long Term Injury (LTI) Conditioning Loan, with the other simply called a Conditioning Loan. Vilardi should qualify for the LTI Conditioning Loan because he’s missed more than 24 days/10 games. If this is the one they use , Vilardi could go to AHL Ontario for six days / three games max. Hence why the dates suggested above may be ideal. Additionally, the team can ask for an additional two games if they feel the first three didn’t give them enough of a sample size to determine whether or not he’s ready for NHL game action. Regular Conditioning Loans are reserved for guys on the 23-man active roster, and usually for those not playing and sitting in the press box, as a way to get them some sort of game action. Because you can’t be a long-term injured player and on the active roster at the same time, that is why we said the Kings likely can’t just pick which type of conditioning assignment they want to use. Currently, it would be the LTI version. However, let’s say that he came off of IR and he was on the 23-man roster….and then they healthy scratched him for a game or two, they could then send him to Ontario as part of a standard Conditioning Loan. Overall, here is where things stand, at least as of the past few days – from what we’ve gathered, there are three options for Vilardi – with all being given equal weight. 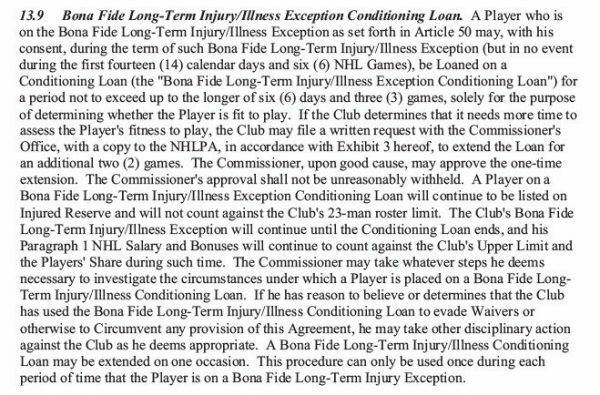 When all is said and done, he could (a) be cleared to play and stay in the NHL, per the original plan, (b) be cleared to play and returned the OHL to finish out the season, or (c) not be cleared in the near future, which would likely lead to him being shut down for the season – with no hard date being set for such a decision quite yet. Option B at least caught our attention this week because we were under the impression that wasn’t even a thought, yet it is at least an option still on the table. To be clear though, it isn’t the Kings preferred option, as they’re still excited at the notion of him playing with the big club this season. As if all of that isn’t enough, how about one more possible plot twist? How, if at all, could the World Junior Championship play into all of this? You may recall, Vilardi was on the list of invitees for Team Canada’s summer evaluation camp back in August. As we noted at the time, it seemed like a curious move because all indications were he’d be in the NHL this season. And, if he was, there was less than a slim chance LA would release him to play in the tournament. Now, given all that has unfolded, things may have changed. If Vilardi was to play in a few AHL games and was then deemed healthy enough for more action, there just might be another option in play. It’s a stretch, but most of the past 12 months have been odd in this journey. Team Canada will hold their final WJC evaluation camp in early December. Would they be interested in having Vilardi participate? Even if he didn’t ultimately make the Canadian roster (the tournament begins December 26th in Vancouver), the several week process could serve as a pseudo training camp for Vilardi – where, in a best case scenario, he would even play in a few exhibition games with Canada. Think of it as another type of conditioning assignment prior to him playing NHL games. This might seem like a bit of a stretch… although, Vilardi’s offensive resume at least warrants a conversation in those circles. Vilardi has been assigned to AHL Ontario. The next three Reign games are this coming Thursday at Bakersfield, Friday at Stockton, and then home on Sunday, December 2 vs Tucson. MayorsManor will be at the game on Thursday and providing updates on Vilardi’s return to game action. Be sure to follow along on twitter for real-time notes and quotes from the Reign v Condors contest. Hypothetically speaking, this could lead to Vilardi playing three games this weekend. Then, LA petitions for two more in the AHL – which would be road games on December 7 and 8. That would all be just before Team Canada camp opens on December 11 in British Columbia.